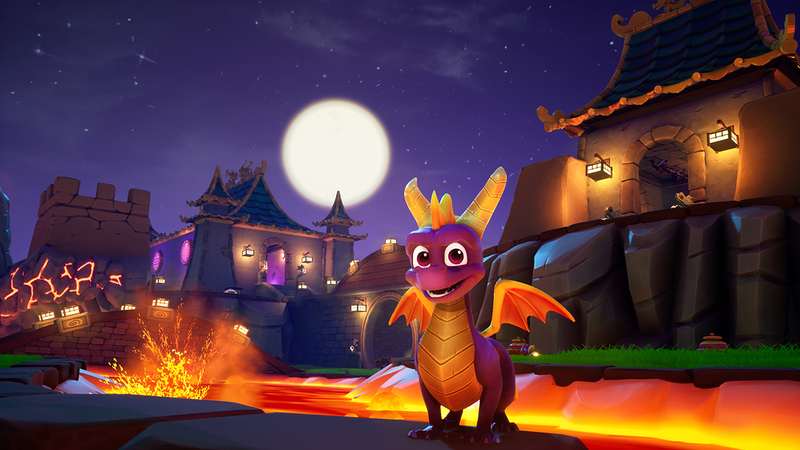 Spyro the purple dragon gets a modern update in this remaster of the original trilogy. Spyro the Dragon was first released on the original PlayStation in 1998. It was followed by two sequels, Spyro 2: Ripto’s Rage and Spyro: Year of the Dragon in 1999 and 2000, respectively. This awesome trio of platforming video games followed the adventures of Spyro the purple dragon, who would have to explore a huge variety of levels and environments to defeat enemies and complete specific goals, all while collecting large amounts of treasure. If you’re nostalgic for these classics, or you’re looking to experience them for the first time, you can now do so in an updated form. The Spyro Reignited Trilogy contains updated versions of all three games, which have been given fresh, modern graphics that flesh out the worlds so many gamers fell in love with the first time around. Here’s a brief overview of all three games. Spyro the Dragon - Spyro and his loyal dragonfly companion Sparx must rescue Spyro’s dragon friends, who have been turned into statues by the evil Gnasty Gnorc. Players can charge into enemies and items to defeat/break them, breathe fire, and glide after jumping to reach far away platforms. Spyro 2: Ripto’s Rage - Spyro and Sparx travel to the magical land of Avalar, where Spyro is recruited by Elora (a faun), Hunter (a cheetah), and a character named the Professor to save the world from the evil Ripto. Spyro keeps his abilities from the first game, and he also picks up a few new ones, like the ability to swim. Spyro: Year of the Dragon - Spyro (who, as usual, is accompanied by Sparx) must recover the dragon eggs that have been stolen by the evil Sorceress. While players control Spyro for the majority of the game, Year of the Dragon also contains levels that introduce new playable characters, such as Sheila the kangaroo, who can jump much higher than Spyro. Users can even play as Sparx in certain areas. The Spyro Reignited Trilogy is available to purchase physically and digitally for $39.99 on PlayStation 4 and Xbox One. The game is rated E10 for Everyone 10+ by the ESRB. Check out the first 16 miunutes of the Spyro Reignited Trilogy (showing off gameplay from the original Spyro the Dragon) to see if your kids would love this game.